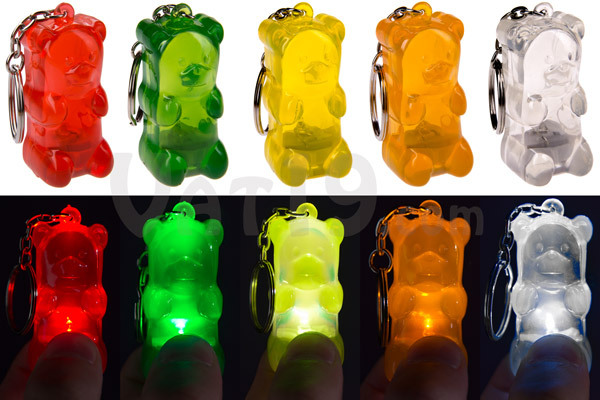 Gummy Bear Keychains: Light-up keyrings shaped like gummy bears. Your keys are about to come down with a scorching case of jealousy. At approximately 9 times the size of a standard gummy bear, the Gummy Bear Keychain will be the center of attention on any keyring. 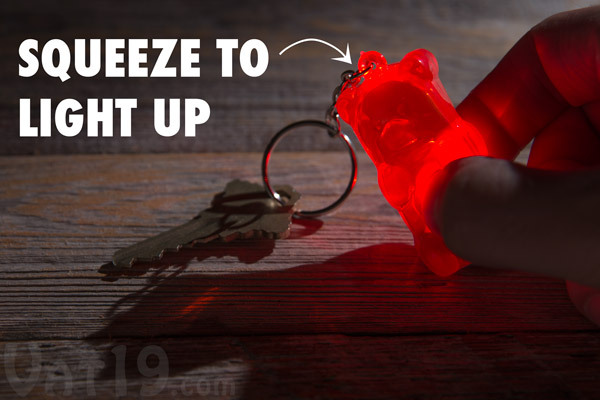 Simply squeeze its flexible plastic tummy and the Gummy Bear Keychain's LED shines to illuminate locks or your other keys. Made from a flexible and durable plastic, the Gummy Bear Keychain is available in green and red. Batteries included. Dimensions: 2.125" x 1" x 1"
If you like gummy bears, you'll love our Gummy Bear Keychains. Simply squish this little guy's tummy to make him light up! True Vat19 fans will instantly recognize that the Gummy Bear Keychain looks like a miniature version of our Gummy Bear Lamps. And you'd be correct! The manufacturer multiplied the cute factor by scaling down the bear to the perfect size for a keychain. Bravo, indeed! 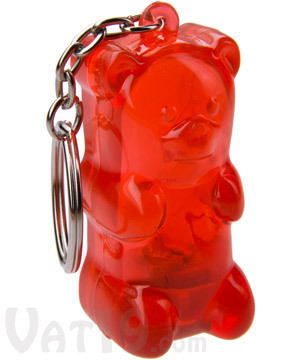 Simply squeeze the Gummy Bear Keychain to make it light up. When it comes to gummy, it's hard not to think of food. However, these plastic bears are not for eating. Rather, they were designed for two distinct purposes: to light up on command and to look awesome. So, when it's dark out, squeeze the bear to find your house key or to illuminate a lock. And when it's daytime, you'll be rocking an awesome keychain accessory. 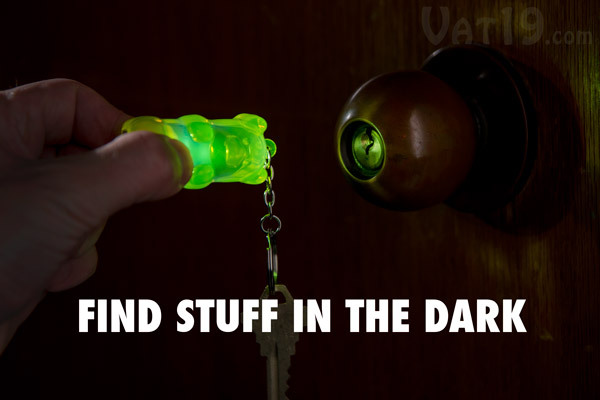 Use your light-up Gummy Bear Keychain to find your keys or illuminate locks. 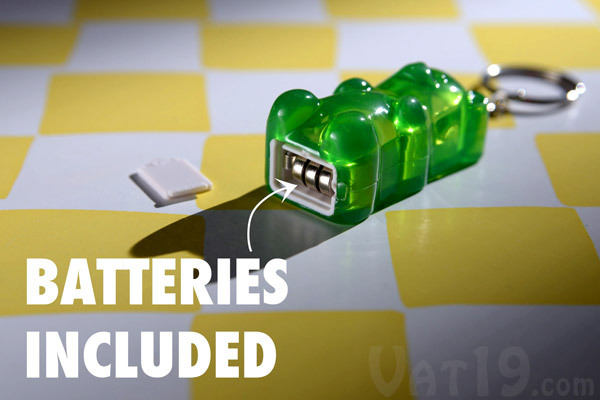 The Gummy Bear Keychain requires 3 x LR41 button cell batteries (which are included) to fuel its LED bulb (which will never need to be replaced). Because LEDs use so little power, you won't need to replace the batteries very often. However, they are readily available at most convenience stores. The Gummy Bear Keychain comes equipped with batteries. 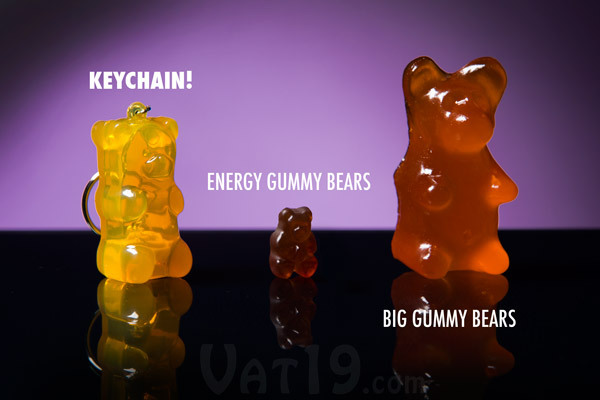 Perfect addition to your Vat19 Gummy Family! As far as gummy snacking is concerned, we've got you covered from I'm-only-slightly-hungry to I-could-eat-a-horse-but-I'd-like-something-a-bit-sweeter. Heck, we've even got gummy bears infused with energy drinks! And now with the introduction of our Gummy Bear Keychain, we've expanded beyond delicious candy treats to bring you an accessory that looks good, illuminates your surroundings, and is great for fidgeting. You'll quickly find that squeezing its belly on and off is surprisingly satisfying! Show your love for all things gummy with the Gummy Bear Keychain. Question: Can I eat them? Answer: No. They're made of plastic, not delicious gummy. Question: But what do they taste like? Question: Does the light stay on when you squeeze it? Answer: The light is only on when squeezing its tummy. Stop squeezing and the light turns off. Answer: The Gummy Bear Keychain requires 3 x LR41 button cell batteries. A complete set is included with each keychain. Replacements can be found at most convenience stores. Answer: No. The LED bulb will last a lifetime. Question: Are you sure I can't eat them? Answer: Seriously, it will taste like you're gnawing on a SkyBall. If you want delicious gummy, try this, or this, or this, or this, or this, or this, or this.